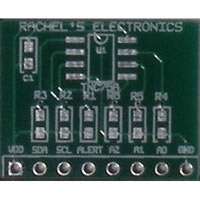 Rachel’s Electronics – new kit maker in NYC « Adafruit Industries – Makers, hackers, artists, designers and engineers! Don’t worry, Rachel’s is here. This store is for electronic hobbyists, DIY enthusiasts, hackers and triple Es. We specialize in breaking out oddly usefully microchips and designing custom kits. Our primary mission is to educate our customers and provide the clearest documentation of our products and their implementation. Update: Looks like the site down. Check back later. Search for her website on google, there is a cached page. Rachel’s is up open for business! Also, check out NYC resistor events for a workshop on the 17th of April featuring our 7 Key Slider/Wheel capacitive touch IC breakout. — Making the world safe for robots.